7 Awesome Stats from NFL Week 10 - Fantasy Football, Fantasy Football Rankings | Mac Bros.
Week 10 of the NFL season has nearly come and gone. Let's look back at 7 feats of statistical awesomeness. 1. 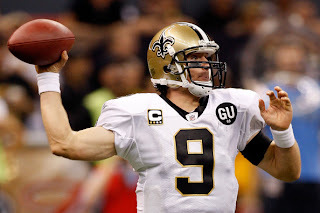 New Orleans quarterback DREW BREES passed for 322 yards and two touchdowns in the Saints’ 26-23 overtime win at Atlanta. Brees leads the NFL with 3,326 passing yards, the most yards through the first 10 games of a season in NFL history. Brees recorded his 51st career 300-yard passing game, tying Pro Football Hall of Famer DAN FOUTS (51) for the fifth-most all-time. 2. Dallas quarterback TONY ROMO completed 23 of 26 passes (88.5 percent) for 270 yards with three touchdowns in the Cowboys’ 44-7 win over Buffalo. In his career, Romo is 17-2 (.895) as a starter in November, the best mark among quarterbacks who began their career in the Super Bowl era (minimum 15 starts). Romo’s 88.5 completion percentage tied TOM BRADY (88.5 on December 27, 2009) and CHRIS CHANDLER (88.5 on September 24, 1995) for the fifth-highest in a game in NFL history (minimum 25 attempts). 3. Chicago’s DEVIN HESTER had an 82-yard punt-return touchdown in the Bears’ 37-13 win over Detroit. Hester now has 12 punt-return touchdowns in his career, the most in NFL history. It marked his 18th return touchdown overall (12 punt, five kickoff and one missed field goal), and he passed Pro Football Hall of Famer ROD WOODSON (17) for the second-most in NFL history. Pro Football Hall of Famer DEION SANDERS (19) holds the record for the most all-time. 4. Arizona wide receiver LARRY FITZGERALD had 146 receiving yards with two touchdowns in the Cardinals’ 21-17 win at Philadelphia. At 28 years, 74 days old, Fitzgerald became the third-youngest player in NFL history to reach 70 receiving touchdowns, trailing only RANDY MOSS (26 years, 269 days) and Pro Football Hall of Famer JERRY RICE (28 years, one day). Fitzgerald (70) also passed ROY GREEN (69) for the most total touchdowns in franchise history. 5. Houston running back ARIAN FOSTER had 102 receiving yards, including a 78-yard touchdown reception, in the Texans’ 37-9 win at Tampa Bay. Foster, who registered a 78-yard touchdown catch in Week 7 at Tennessee, joins Pro Football Hall of Famer WALTER PAYTON (two in 1983) as the only running backs to have two 70+ yard TD receptions in a season since 1970. 6. Philadelphia running back LESEAN McCOY rushed for 81 yards with one touchdown against Arizona. McCoy, who leads the NFL with 10 rushing touchdowns, joins Pro Football Hall of Famers LENNY MOORE (1964) and O.J. SIMPSON (1975) and GEORGE ROGERS (1986) as only the players to score a touchdown in each of the first nine games of a season since 1960. 7. In Pittsburgh’s 24-17 win at Cincinnati, the Steelers’ MIKE TOMLIN joined Pro Football Hall of Famer CHUCK NOLL (193), BILL COWHER (149) and RAYMOND “BUDDY” PARKER (51) as the only head coaches in franchise history to reach 50 regular-season wins. The Steelers join the Giants (six), Packers (six), 49ers (four) and Colts (four) as the only franchises with at least four head coaches to win at least 50 regular-season games.